To envision the evolution of the any experience you need to think of your organization as a net of interconnected touchpoints: Clients and employees, technology, products, processes and operations, your business model… all these “relationships” formulate who you are as an organization. Service Design focuses on the careful orchestration of all touch points across journeys by designing around human needs instead of the organization’s view of the world. Approaching such change through the silo of a business function leads to a single focus on one area, i.e. customer experience, without a holistic understanding of connections, dependencies and purpose. Service Design is an approach to visualize and break down complex interactions and dependencies across the organization. Breaking out of traditional “lanes” and silos, to examine how an organization actually “gets work done”. It breaks down and looks at the interactions and touch points, including the frontstage activities that impact the clients directly, and the backstage activities that clients do not see. The Service Design approach efficiently creates alignment around a shared vision and delivers the thoughtful orchestration of interactions and touchpoints across an organization’s ecosystem while designing around the human needs of all involved (customers, employees, and other stakeholders). It helps to bridge the inherent gap between customer needs and internal processes by planning and organizing people, infrastructure, communication, and material components to improve product, service, and interaction quality. 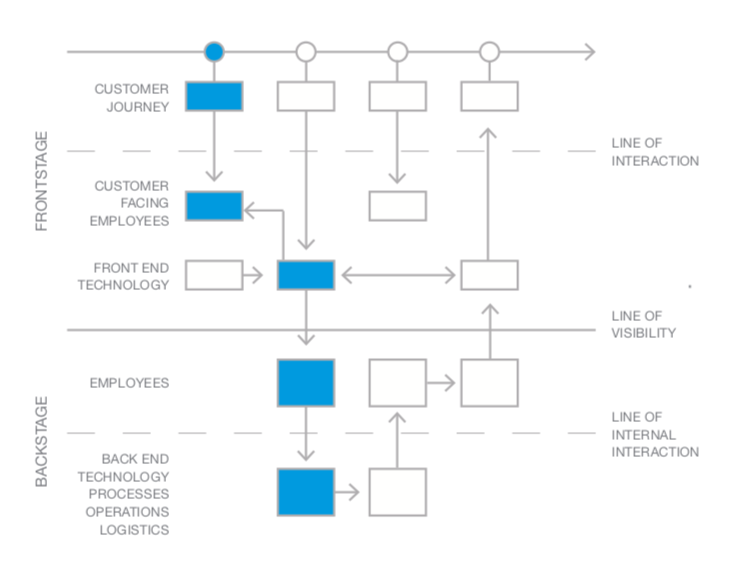 One major element to Service Design is the Service Blueprint it visualizes the beginning-to-end journey and how an organization creates and delivers an experience. It clarifies the interactions between recipients/users, touchpoints, and providers, including the frontstage activities that impact the recipient directly, and the backstage activities that the recipient does not see, but are critical to understanding and improving the experience. The blueprint is a fundamental cross disciplinary visual communication tool that builds understanding and alignment. Through a holistic view of your organization and how work gets done, a Service Blueprint reveals service gaps and opportunities. This allows business to prioritize critical work, identify high priority focus areas and design solutions to work within your ecosystem. The outcome is a more efficient method for driving successful experiences that satisfies customers and employees and has measurable impact. It accelerates speed to value through speed to decision-making across the organization. Service Design orchestrates the cross disciplinary teams to align and frame the desired customer/employee experience. Service Design demands change from an organization. Managing this change is an ongoing challenge that begins at the earliest stage of a Service Design initiative. It’s recommended that the core Service Design team embed change practices or what’s called “New Ways of Working” within these initiatives rather than making change management an entirely separate effort. Everyone on the team needs to be involved in shaping and sharing these “New Ways of Working”. Delivering these “New Ways of Thinking” & “New Ways of Working” is what Service Design is all about, the Service Design teams need to manage the organization as well as the service design work. What’s the business value of Service Design? It uncovers and diagnoses challenges in the larger context of the entire organizational ecosystem rather than a single point of view. It creates experiences that are more relevant and impactful for customers and employees by orienting the solve around human needs. It actualizes a human-centric organization by prioritizing initiatives that advance business gains and drive internal momentum. It develops organizational capabilities needed to sustain progress by accentuating co- creation and capability building.